Several years ago, before we got married, Russell lived in Oklahoma and suffered through the worst ice storm in years. A few years later, when we lived in Northern Virginia, we went through some of the worst snow storms in decades (our first experience shoveling snow). Jake spent his first week home from the hospital in a blizzard; in Georgia! In short, when we realized we would be facing a Kansas winter this year we weren’t too excited due to our history of carrying terrible weather with us. As soon as we moved to kansas we ordered a snow shovel and an ice chopper so we would be prepared for anything. Luckily, this winter has been mild compared to most Kansas winters (knock on wood it stays that way!). I believe there has been one big snow storm so far, and that occurred while we were home for Christmas. Even though this winter had been mild, it has still been very cold--as in some days not getting above 20 degrees F cold. A few weeks ago there was sleet and light snow-- and when the weather gets colder, I want soup. I have been on a soup kick (more like obsessed with soup) and have been making a new soup about once a week. It is perfect for when it is cold and snowing and makes great leftovers. 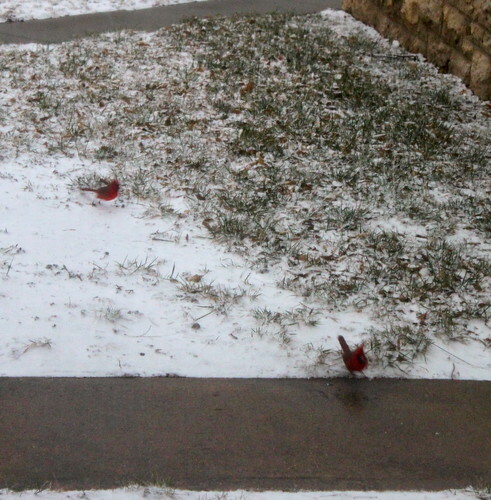 Red birds playing in the snow outside our window. Bailey really enjoyed watching them. 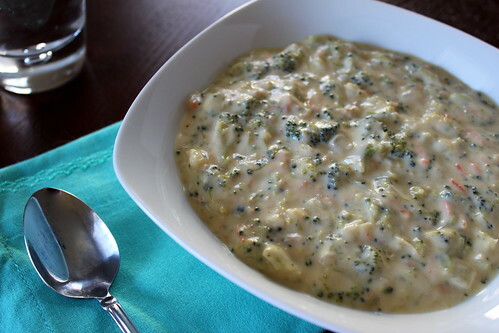 My sister sent me this recipe for broccoli cheddar soup and I could not wait to make it. We always send each other recipes and I can always count on her to send me something great--This soup was no exception. It is very similar to Panera’s broccoli and cheddar soup, but better. I think the best part of the soup is the broccoli, so I used two small heads of broccoli (about a pound) to make sure there was enough for each bite. Russell had his over white rice--while I preferred a crusty piece of French bread. In a large pot, melt butter and whisk in flour. While constantly whisking, cook for 3-5 minutes. Add in the half-and-half. Add the chicken stock and simmer for 20-25 minutes. Next add the broccoli, grated carrot, and sauteed onion. Cook over low heat for another 20-25 minutes. Season with salt and pepper to taste and then stir in shredded cheese. Cook until all cheese has melted. Serve over white rice or with crusty French bread.